Baraveha is the highest hill in the W Limerick/N Kerry area and the 729th highest in Ireland. Baraveha is the second most southerly summit in the W Limerick/N Kerry area. The village of Cordal is probably a good reference point for the three western hills in the sprawling Maullaghareirks. From the village continue southeast, and having crossed a hill, take your first left (north). There are two lefts in close proximity - take the first one. This minor road becomes an uneven track (bad for low-slung cars, like ours) and terminates at a gate (R1080 0815 C). We crossed the gate and followed the track for a short distance, and once past some trees we climbed right, up a cattle-rutted hillside (bovine-free, thankfully). 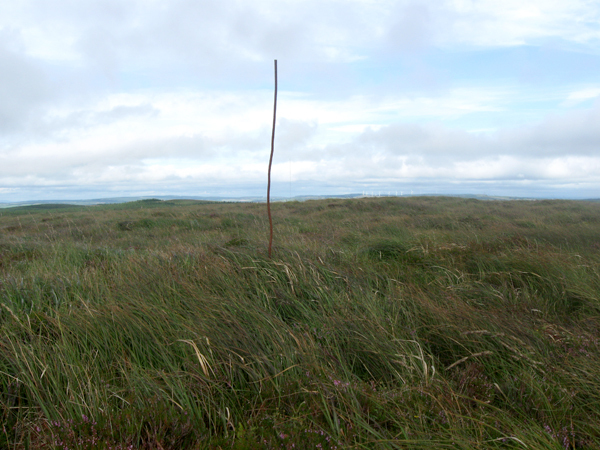 The broad eastern ridge is quickly gained, and it's a straightforward but bleak walk to the summit, curiously marked with a single iron rod stuck in the ground. Looking NW to Mount Eagle, you could envisage a longer walk linking Ballinard to Mount Eagle to Barraveha, notwithstanding the glut of forestry in the area.